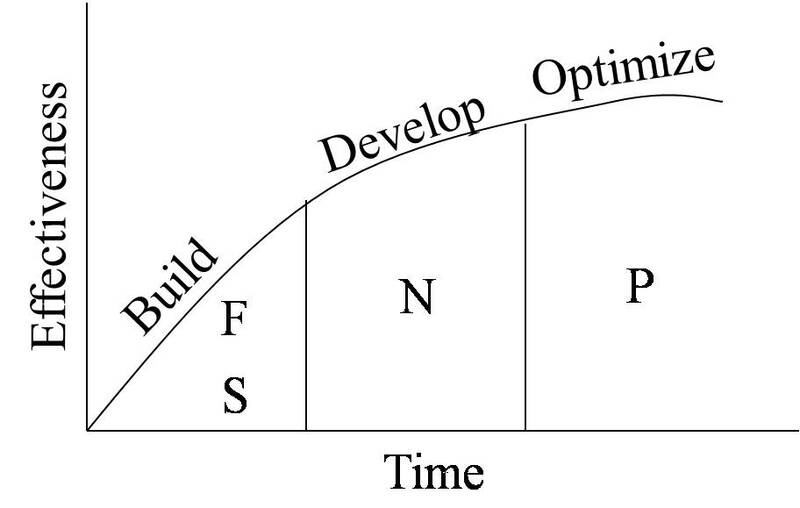 Posted on March 26, 2011	by Swastioko Budhi S.
The Forming Storming Norming Performing theory from Bruce W. Tuckman is an elegant and helpful explanation of team development and behavior. Teams members uncertain about roles and expectations. Team members try to assess themselves and others. Reliance on strong, formal leadership. Guidelines for a successful forming stage: Provide structure to the team by assigning and clarifying task/role, Encourage participation, Share all relevant information, Encourage open, honest communication among team members. Deals with power and decision making. Members challenge the differences in an attempt to gain their individuality and influence. The team members need control and sense of direction. To help through this stage, some guidelines are: Assist the team members to establish methods that support the communication of their different points of view, Determine within the team how the team will make decisions, Encourage members to share their ideas about issues, Facilitate methods to resolve conflicts. Members produce as a cohesive unit. Members work collaboratively to gain and share insight. To best facilitate this stage, some guidelines are: Talk openly and honestly about team issues and the members’ concerns, Encourage feedback, Assign tasks for consensus decision making. Members have learned to work together. Member’s skills to define tasks, manage conflict, and work towards producing results. The members are committed to the team and its goals. Guidelines for this stage are: Jointly set goals that are challenging and accepted to all members, Continue to look for ways to promote the team’s chances to excel, Keep an ongoing assessment of the team, Acknowledge each member’s contribution, Develop members to their fullest potential. Everyone can move on to new things, feeling good about what’s been achieved. We could call that Dissolving or Transforming. After reading some literature submitted by Dr. PDG on Tuckman Assessment and experiences during the AACE Certification Preparation Course for 5 days, then I have the feeling that SubaJou team in stage 1: Forming. To prove the truth of my feelings at the top, then start filling questionnaire submitted by Dr. PDG. 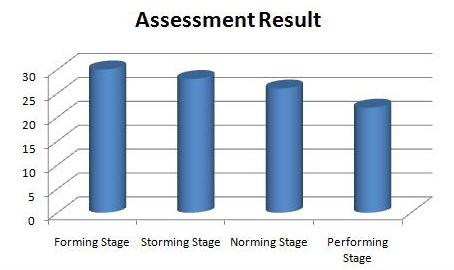 The test results were the same as my feeling that SubaJou team is still in the stage 1: Forming. The test result above was quite different from those obtained by other colleagues. But I remain in my previous conclusion that Subajou team was still in the stage 1: Forming because by a 5-day training course AACE, team members still not familiar with either fellow colleagues. SubaJou team still need a few other activities prior to entry into the next stage of stage 2: Storming. It is important for the SubaJou team members to know that teams don’t just form and immediately start working together to accomplish great things. There are actually stages of team growth and teams must be given time to work through the stages and become effective. The aim of the leader or manager is therefore to develop the team through the four stages, and then to move on to another role. Commit to the goals of team. Perform assigned tasks completely, accurately, on time. Respect the contributions of others. Ask for help before we get into trouble. Follow guidelines for effective meetings. Actively participate in team deliberations. Focus on problems not people or personalities. Constructively resolve conflicts or differences of opinion. Members of the SubaJou team scattered in several places (Jakarta, Papua, Sulawesi, Africa) making it very difficult to meet and discuss to achieve the expected target. To overcome this problem, I propose that SubaJou team transformed into a virtual teams. Virtual teams meet electronically since members are physically dispersed. Virtual teams may be flexible and efficient, but the lack of face-to-face interaction may weaken trust, communication, or accountability. Respect: Ensure everyone feel they have a voice on the team. Be in the moment: Pay attention to the meeting you are in – no cell phones, checking e-mail, etc. Contribution: Everyone should be clear what they should do to contribute to the team’s goals. Meet face-to-face to start a project and for major milestones. Assume positive intent: If an e-mail’s tone sounds off-putting, withhold judgment until you learn more or talk to them directly via phone. Engage in positive predictable behavior: Honor commitments, attend meetings on time, don’t send terse emails. Establish regular times for group interaction. Set up firm rules for communication. Use visual forms of communication where possible. Emulate the attributes of co-located teams. Give and receive feedback and offer assistance on a regular basis. Agree on standard technology so all team members can work together easily. Consider using 360-degree feedback to better understand and evaluate team members. Provide a virtual meeting room via intranet, web site, or bulletin board. Note which employees effectively use email to build team rapport. Smooth the way for an employee’s next assignment if membership on the team, or the team itself is not permanent. Be available to employees, but don’t wait for them to seek you out. Encourage informal, off-line conversations between team members. Clark, D. (2007). Donald Clark’s Tuckman’s Questionnaire. Tuckman, B. (1965). 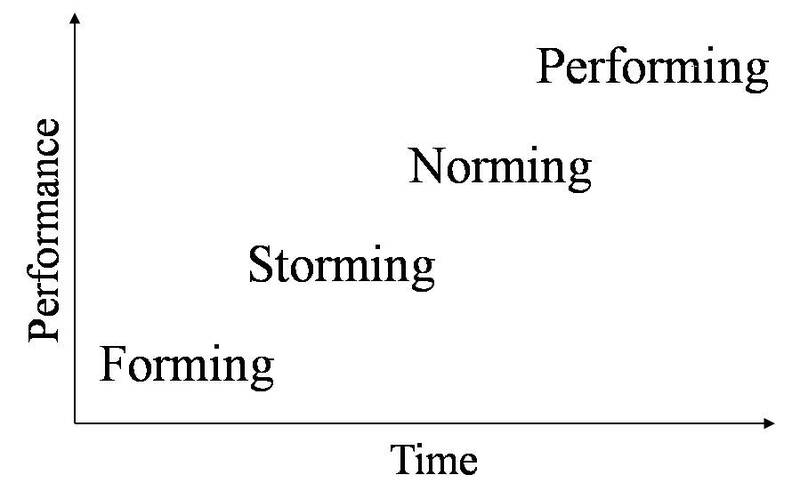 Bruce Tuckman forming storming norming performing team development model. Tuckman, B. (1965). Bruce W. Tuckman – forming, storming norming and performing in groups. “Form, Storm, Norm, Perform.” changingminds.org. This entry was posted in Swastioko Budhi, Week #1, Weekly Submission. Bookmark the permalink. Excellent, Pak Budhi!!! Nicely written and nicely researched!!! I especially loved your paragraph about working in virtual teams!!! Big challenge, but a skill set we need to become proficient at, if we want to live and work in the 21st Century. The only thing holding you back is the word count. At close to 1,000 words, you need to learn how to be more concise and to the point. I am trying to get you in the habit of producing 300 to 500 word blog postings- short, concise and very focused on addressing a problem. Keep up the good work and don’t forget, for next week, I am not assigning you a topic. Up to you to pick one, but I recommend that you pick a “problem” or “opportunity” related to your paper topic. Either that, or a real topic from your day to day working world.